Understanding how and why color works in painting has been made much easier in Michael Britton's Applied Color Theory Instant Download Text and Exercise Books Workshop. Begin with learning the basics of color and proceed step-by-step on how to build dynamic color harmonies. Using both historical master paintings and his own work, Michael clearly demonstrates and illustrates each facet of color interaction. For the over 12 years Michael taught his very popular Applied Color Theory Workshop to both beginning and professional artists who have paid almost $300. 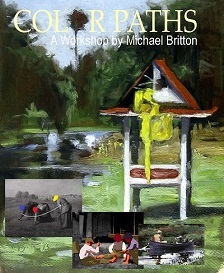 In this workshop, that includes a comprehensive Exercise Book (that you can print out as many times as you like so that the exercises can be repeated with greater and more refined complexity), Mr. Britton has significantly expanded upon his original Applied Color Theory workshop. Whether you are a realist or an abstract painter color is the prime material of your work. A painting whose drawing is weak can still be a good work if the color is strong and harmonious. However a painting that is exceedingly well-drawn but has a poor and timid color scheme will fail. Ideally, of course, a painting should possess both excellent drawing and color. And composition! Get My Applied Color Theory FOR ONLY $22.95!